There are two main rainy seasons in India called The Monsoons One is the current season in most parts of Western and Northern India called the South West Monsoon and the other later in the year operative in most of the Eastern parts of India, called the North Eastern Monsoon. Though both impact the other areas as well it is to lesser intensity than during their main season. I live in the Western part of India and right now am enjoying the rains. The Indian month of Shravan or Savan is poetically inspiring from ancient times and the most often used symbolism is the Peacock dancing announcing the onset of rains. Most Indians believe that the dance is the harbinger of the monsoons but, science, the spoil sport, states that it is simply a coincidence that the mating season for them falls during the monsoon time. It is simply the mating ritual of the peacock to attract some peahens! Ever since I can remember, the monsoon season has been my favourite every year. I am very fortunate that I live in Pune where it is at its best. I love to sit in our verandah and watch the rain fall in our little garden and also enjoy seeing people enjoying getting wet. My son Ranjan is one such and one never knows when he will get it in his head to come down in pouring rain into the garden to get wet and just commune with nature. I used to do that but, now I cannot risk slipping and falling down so I avoid it. One of the very few things that I miss not being able to do. 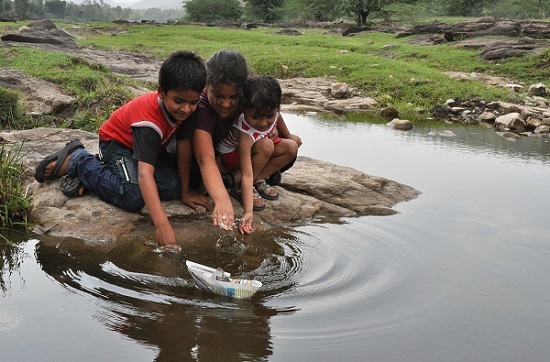 Another thing that I used to enjoy as a child accompanied by my siblings was making paper boats to float on puddles and runoff streams. I taught the same to my son when he was little and used to enjoy watching him chase the boat as it floated off. Another pastime that I cannot indulge in any more. I do however enjoy one more thing associated with our monsoons. Eating hot corn cobs roasted on charcoal fire with masala added on to it. Unlike the old days when I used to go to the hand cart that sells this in our neigbourhood, I have to get it delivered at home. That is the only difference but, the taste brings back many memories, it does. And finally and before I forget, I have a date with Ursula to dance with her in the rains on the streets of London before I pop off. She will not let me forget it and I have to make some effort to keep that date. Today’s topic for the weekly 2 on 1 blog posts was suggested by me. Please do go over to the other participant Shackman’s blog to see what he has to say about the same topic. This entry was posted in Blogging, Family, Nostalgia and tagged Corn on cob, Monsoon, Paper boats, Shravana, Wikipedia. Bookmark the permalink. They call our rainy season the “monsoon season”, but you would laugh by the comparison. We did get rained on when we went grocery shopping this evening — we loved it. Yes, I would indeed. I have been following your posts about the climate there and I am sure that if you had rains with the intensity that we have here, you will have new problems. Peacock dancing caught my eye— fanciful! Reminded me of a couple blog posts I wrote a few years ago apart from each other regarding my Peacock Feather Dilemma. I still have my peacock feathers in my house. Do you mean the peacock dancing does not bring on the monsoon??? I, too, enjoy certain types of rain, so can appreciate your description of sitting on the verandah watching the falling rain. 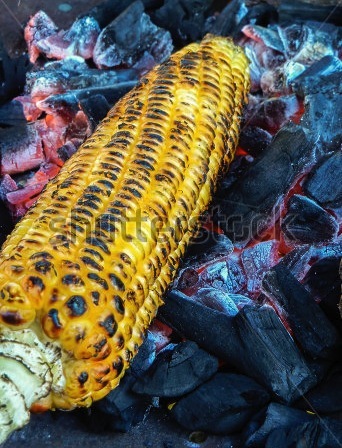 Roasted corn on the cob is a favorite of mine, too. Now I place them in my microwave with a few shucks remaining over the kernels, cook for about 3 minutes, then butter them afterward. I was unfamiliar with the term masala but research says in India it means a mix of spices — something I’ve not tried with my corn. Probably could add some spices to my butter, but perhaps that should be done with ears buttered before cooking. I have shucked them and added butter, then enclosed in Saran Wrap. Hm-m-m — food for thought. I would advice adding a mixture of salt and pepper after you butter the cob. Instead of butter, we use fresh lime and add salt and pepper or for the more adventurous, chilly powder. oh my. a wonderful sense filling post! but then I love the rain so much… any post even talking about it is lovely. now I have a desire to eat some delicious buttery corn on the cob. I wish that I could be a fly on the wall when you eat that corn on the cob. Whenever the phrase “whatever floats your boat” is used, I remember those days with great nostalgia. Have fun with the corn! rain here is a mixed blessing, there isn’t a particular time when it rains daily – but it’s also a necessary object for the water supply for our big and ever expanding city. From what I remember of New Zealand from my visits in 1986/7, it was very much like the UK with rains round the year! I liked the green everywhere.